While filming volume two of Bigfoot Road Trip, I was treated by seeing (and holding and caressing) many lost treasures of bigfoot history. Among them was this little gem. 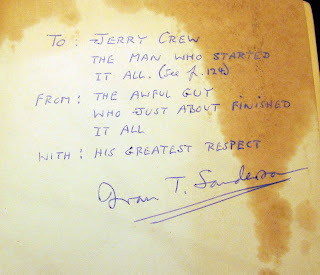 Ivan T. Sanderson gave Jerry Crew a copy of his book, Abominable Snowmen: Legend Come to Life. 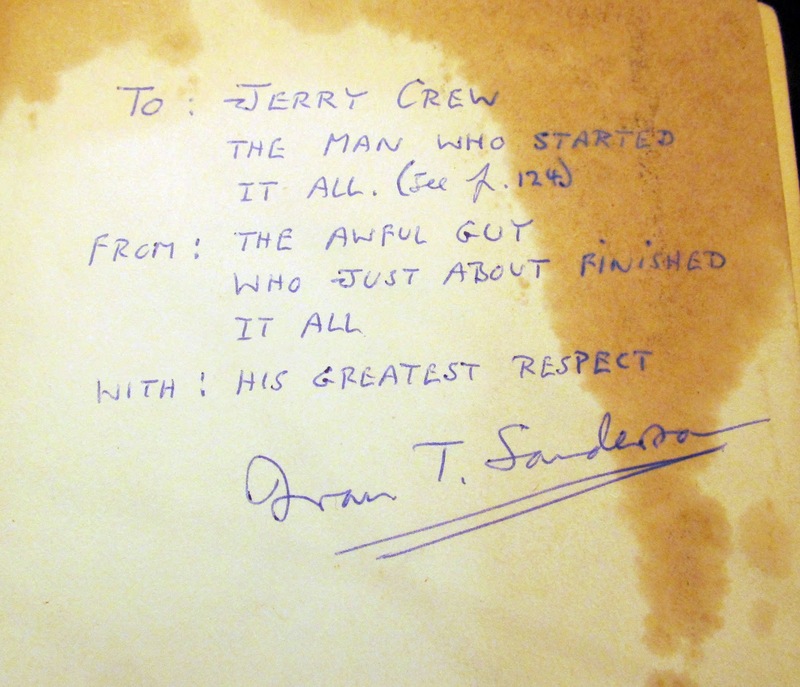 Sanderson was kind enough to write a short, personalized inscription into the inside cover the book, which Jerry kept safe over the years (though a little water damage and time has taken their toll). Sanderson and Crew knew each other well, and considered each other friends. 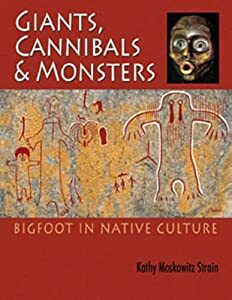 Besides this book, there were letters from the men to each other, as well as other relics from the history of bigfooting. Many of these will be showcased for the very first time with the release of Bigfoot Road Trip, Volume 2, expected to be released this summer. March 27, 2013 in Sumatra. While hunting birds in the jungle, the witness stumbled across sign of a passing orang pendek. He found a line of footprints and broken trees (probably bamboo, but possibly sugarcane) that might have been foraged upon. He also found a pile of leftover fruit and husks in the footprint line. He notified John, the tracker for the Orang Pendek Project, and returned to the site to cast footprints. For more photos and information on this cast, click here. Click this link to visit the London Trackway Index. I am pleased to publicly announce the Orang Pendek Project, an international cooperative effort to document data supporting the existence of the orang pendek of Sumatra. Researchers on three continents are pooling their resources, knowledge, and efforts to find, gather, and document evidence that might eventually lead to the official academic acknowledgement of the existence of these diminutive bipedal apes. A section of my website, CliffBarackman.com will be devoted to showcasing the data collected. This project has been quietly gathering evidence for a year now, and the results have been extraordinary. Too much evidence has been collected to share at once, so over the coming weeks and months, I will be adding data as I am able. Keep checking back for more information and evidence! Click this link to go directly to the data index of the Orang Pendek Project. 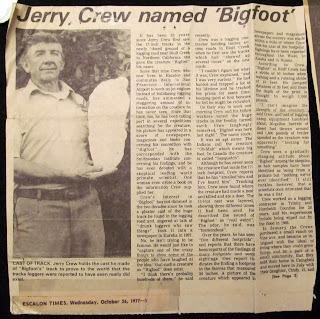 Any bigfooter who was alive in the 1970′s has been influenced to some degree by the movie, The Legend of Boggy Creek. This 1972 pseudo-documentary certainly affected me in a huge way. Little did I know that decades later I would be visiting Fouke, Arkansas in an attempt to run into the Fouke Monster for myself. Click here to read the rest of my field notes for this episode. This footprint was not cast, and the above photo, along with the others on the track's entry page in the database, are the only record of its existence. Click here for more information on this print. Yet another one of the London Tracks has been added to the database. London Track number 44 produced a well-defined cast that shows some interesting details, including what might be an interpalangeal joint in the first digit. Click here to find out more about this print. I love Halloween, and to celebrate this holiday, I've decided to hold a costume contest on my official Facebook fan page. The three winners will receive free copies of my DVD, Bigfoot Road Trip. The rules are below, but go to my Facebook page to participate! Have fun! The Theme is: "Keepin' It Squatchy"
1. The DAY AFTER Halloween - on Friday, November 1st - I'll make two Facebook posts throughout the day. 3. 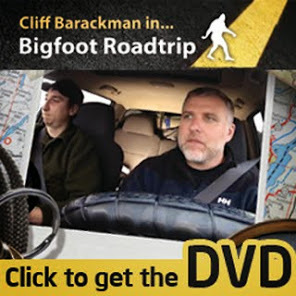 The 3 separate photos with the most 'Likes,' or just my personal favorites, will win one of my new Bigfoot Roadtrip DVD's! This contest ends at 12:00 Midnight MDT on Friday, November 1st. Winners will be notified by Facebook message on Saturday, November 2nd. Please note; many kids watch my Facebook page, so let's keep the photo's and comments fun and clean! 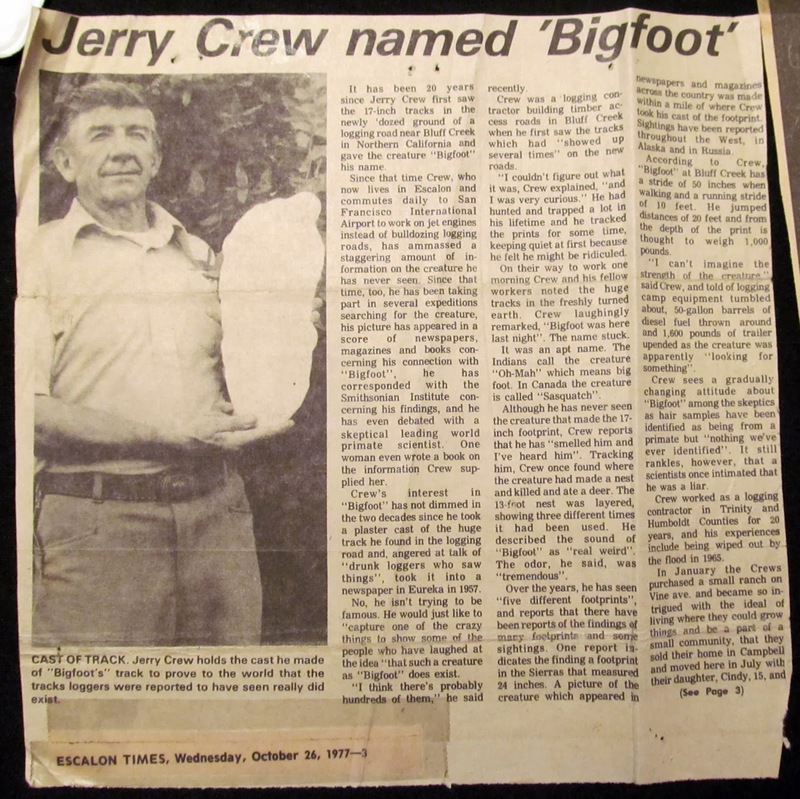 From the files of Jon Crew comes this interesting article from October 26, 1977. A lengthy interview with more historical artifacts from the Crew family will be featured in Bigfoot Road Trip Volume 2, due out next summer. This past week, I was lucky enough to be featured on an internet radio show hosted by Ryan Fielder, one of the forward-thinking hosts of a program on EverybodyHasaPodcast.com. I spent about a half-hour with Ryan and others, and what they have produced is now available. On Thursday night, I will be speaking at Washington State University in Pullman, WA. It is an honor to have been invited to the campus where Dr. Grover Krantz once taught! 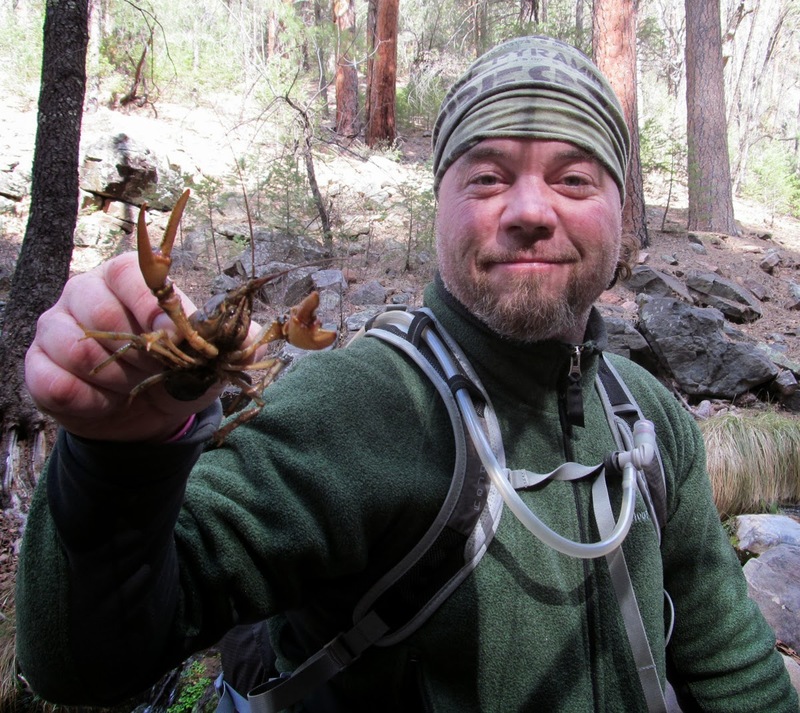 I will be presenting a talk on the best evidence for bigfoot, featuring videos, photographs, footprints, and more,and I hope to see you there! Attention nerds, geeks, and those in denial! Finding Bigfoot is coming to the New York Comic Con on Saturday, October 12th. There will be a couple opportunities to meet us or hear us speak throughout the day. You might even find us hobnobbing with various superheroes (or heroines) after the gig over a tasty pint in one of New York City's fine brewpubs. Between 1:30 and 2:30, I will be signing copies of the new Finding Bigfoot book. The other cast members said they'd drop by the table and sign for a while as well, so come find me and say hello. Click this link for more details on the book signing. Later in the evening, the entire Finding Bigfoot cast will be doing a panel discussion led by our executive producer at Animal Planet, Keith Hoffman. You also know him as the host of the "After the Show" episodes that have become so popular. The panel discussion will be from 7:45 until 8:45. Click this link for more information. Be sure to get in line early for this one, as seats are limited. It was pitch black. We couldn't make a sound. And all we had to protect us were vision cameras, sticks, and a few chicken wings. We heard a splash that made us jump. 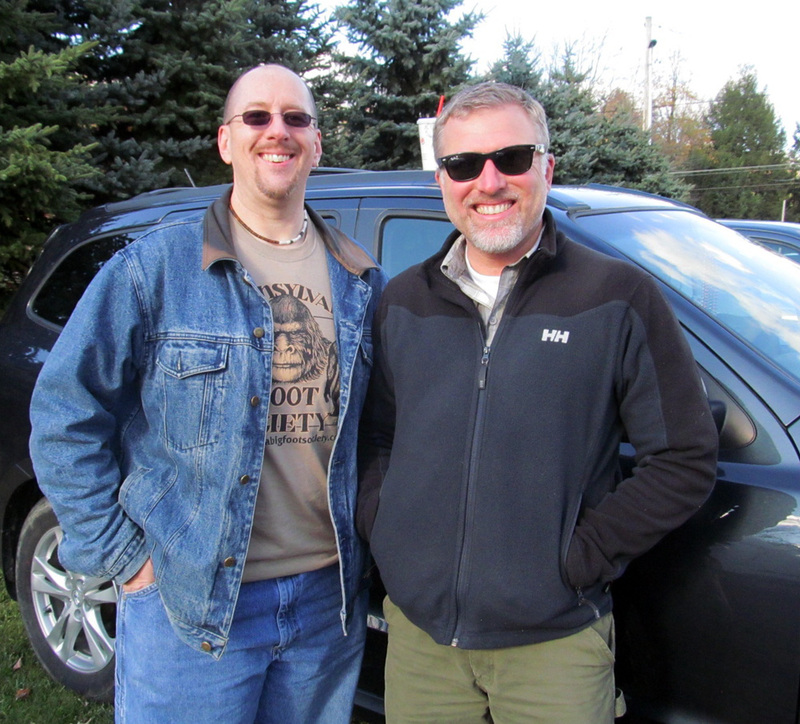 HuffPost Weird News went on a Bigfoot hunt in the pine wilds of New Jersey with Cliff Barackman and Tyler Bounds of Animal Planet's "Finding Bigfoot" -- and conditions were perfect. The weather was calm at the Franklin Parker Preserve, where we had exclusive access for the night. Some ambient light gave us a farther sight distance. We started our trek with a simple tactic: The "knock," which consists of banging sticks against trees. London Track number 76 has now been added to the database. This one is particularly clean and well-defined. All five digits are clearly visible, and there is some indication of independent toe movement. For more information and photos of this cast, click here. This recent article caught my eye because the location is very near where we filmed the Virginia episode of Finding Bigfoot. It sounds like they had a pretty aggressive bigfoot in the area over 100 years ago. It seems that all across America, there are areas that have tales of what might be called “Bigfoot stories.” Virtually all of them tell of a super-sized giant resembling a human being. The detailed descriptions vary as to size and shape, but there are some things in common. Generally it is told that the footprints are in the 18-20 inch range. Also, the gigantic body is usually covered in black or brown hair. This hair is usually said to be muddy or matted and in most cases, there is a long, overwhelming eye-burning scent that lingers long after the beast has passed. Some say they have encountered the scent without encountering the sight and have fled. Most of these bigfoot reports come from the Pacific Northwest, but there are other scattered stories coming from other parts of the nation. In Virginia, I am aware of reports that include Culpepper, Dinwiddie, Orange, Highland, Amherst, Bath, Prince William, Giles and Wythe counties. 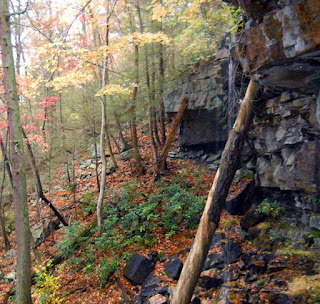 In the area of Tennessee near Bristol, there are claims made of such in Johnson, Greene, Hancock and Hawkins counties. To read the rest of the article which includes some interesting behavior reports, click here. Watch the video below for light-hearted footage of me taking Huffington Post reporter, Andy Campbell out for a night investigation in the New Jersey Pine Barrens. Andy is a good guy, and well-versed on much of the current bigfoot news that hits the mainstream media. 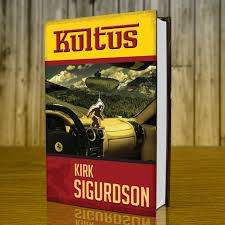 His stuff is worth a read. There's actually a lot of bigfoot-related stuff this week in the "Weird" section of the Huff Post. Maybe you should check it out. London Track number two has now been added to the database. It was not cast, but was photographed with a scale item. This is also one of the footprints from which step length metrics were derived. 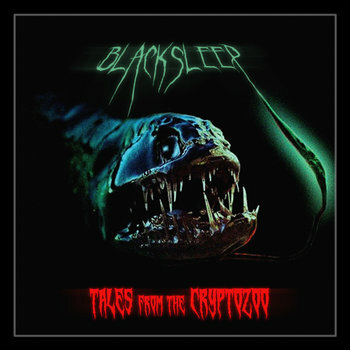 Click here to learn more about this track. Track number 52 offers clear impressions of all five toes, which is fairly rare among the London Tracks. The drag-out marks on the distal edge of the toes is very smooth, yet the underside of the toes themselves is quite rough. The striations are angled towards the medial edge of the foot, possibly indicating a leg-lift towards the centerline of travel when the foot was removed from the substrate. This sounds like a no-brainer, but the scientific debate has lingered for almost 90 years. Finally, the relationship between the foramen magnum (the hole at the base of your skull through which the brain stem transmits) and bipedalism has been proven beyond doubt. This is important to us bigfooters in regards to future cranial discoveries of apes, and particularly hominids and our ancestors. As we learn more about bigfoots, humans, and our relationship on the primate family tree, we need to know where the big hairy guys belong. Are they hominids? Are they Silvapithecus offshoots? Are they something else entirely? Only by learning about our ancestors can we shed any light onto these mysteries. Certainly, chief among the concerns about possible ancestory would be bipedalism. Sep. 26, 2013 — Anthropology researchers from The University of Texas at Austin have confirmed a direct link between upright two-legged (bipedal) walking and the position of the foramen magnum, a hole in the base of the skull that transmits the spinal cord. Wake the kids, call the neighbors! The new season of Finding Bigfoot starts on November 10th! And the season opener is a doozy, to say the least. The Finding Bigfoot team goes one of our "bucket list" locations with a visit to Fouke, Arkansas, and specifically to Boggy Creek. 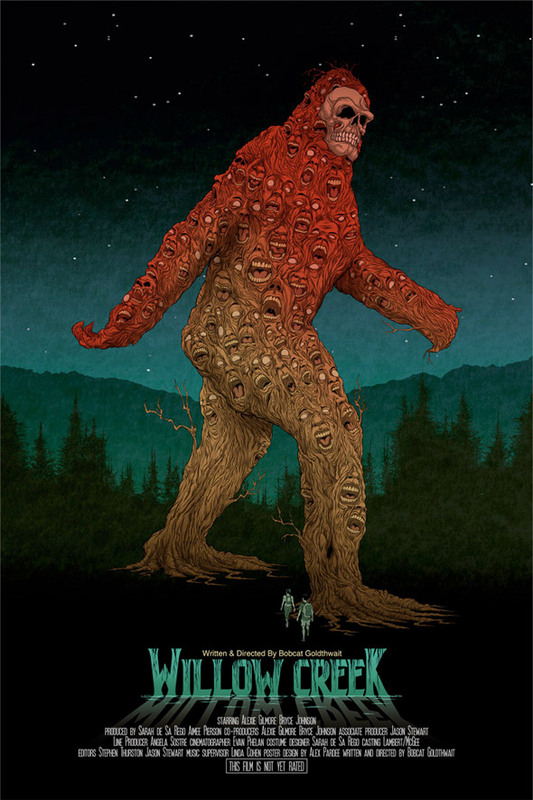 Any bigfooter of my generation is keenly aware of the movie, The Legend of Boggy Creek. We enlist the help of Lyle Blackburn, the single best authority of the movie, the community, and the bigfoot activity that continues to happen in the area to this day. Using footage from the movie itself, the episode will blend modern investigations with decades-old footage for a unique and interesting view of current activity in the area. For more information on the next season of Finding Bigfoot, click this link. 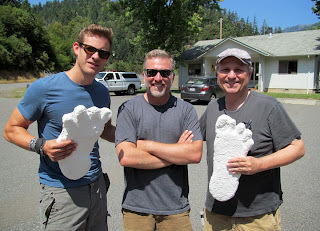 A few days ago, I posted another cast to my ever-growing bigfoot footprint database. This was the Stillaguamish cast from 1980, documented by Douglas Trapp. Shortly thereafter, I received an email from my good friend Daniel Perez, publisher of the Bigfoot Times newsletter. He knew Douglass Trapp personally around this same time, and indeed did investigations with him on more than one occasion. Daniel supplied me with the above newspaper clipping from the Lake Stevens Journal that gives details about the track find. Most interestingly, this article supplies us with what might be the only photograph of the other footprint cast taken at the site (there's another avenue I'm working on that might supply us with more photos, but this is far from certain). In my research on the cast in Dr. Meldrum's collection, I discovered language that seemed to indicate there was more than one cast made at the site, and that the "only surviving" cast was to be found in Meldrum's lab. Thanks to the photos that accompany this article, now we know for sure. London Track number 70 was left in a nice patch of sandy substrate, which recorded the general shape of the foot quite nicely, but with few details. The deepest part of the impression is the lateral side of the ball and heel, with the ball being slightly deeper. To learn more about this track, click here. Though this cast looks blobby and indistinct upon first glance, a closer look reveals this to be one of the most important of the 122 footprints of the trackway. Details in toe depth make this cast next to impossible to hoax with a rigid prosthetic. It was one of 20 or casts from the London data set chosen by Dr. Jeff Meldrum to scan into the Virtual Footprint Archive. Click here for more details about this unique footprint. London Track number 73 is a fairly nondescript cast. It shows digits numbers one through four quite clearly, but the fifth digit barely registered at all leaving only a hint of its impression. The toes impressed to varying depths. The difference in depth between digits one and two is 3 mm, digits two and three is 8 mm, and between digits three and four is 8 mm. Click here for more information about this cast. filming the "solo" camping trip for Finding Bigfoot. 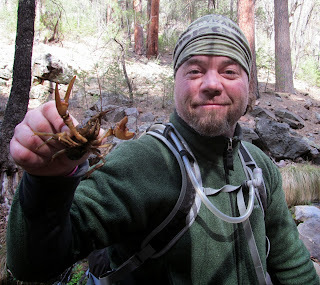 Friend, researcher, cameraman, and Finding Bigfoot's "outdoor technician," Tyler Bounds was recently interviewed by National Geographic for a short travel piece. The theme of the article was how to find bigfoot, and Tyler gave some good advice for newbies and old hands alike. If you've been in bigfooting for more longer than Finding Bigfoot has been on the air, then you certainly know about the Pennsylvania Bigfoot Society and one of its founding members, Eric Altman. 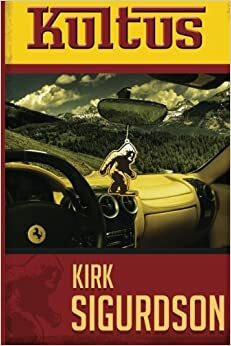 For the newbies who have only recently taken up residence in Bigfootland, Eric is a long-time researcher of bigfoots, and all sorts of other weird things. Eric is my go-to guy for investigating reports in the PA area, and he graciously helps me research sighting reports from that area of the country. He and his colleagues in the Pennsylvania Bigfoot Society conduct thorough investigations, often on-site with the witnesses. Eric and the PBS have been invaluable resources for me over the last few years. Eric has now launched his own personal website to feature some of his own work. Included in his links are media appearances, links to his excellent radio program called Beyond the Edge Radio (on which I've been a guest), and, of course, a link to the PA Bigfoot Society. I would like to encourage you to drop by Eric's page and explore a bit. Send him a hello via his contact page, and tell them I sent you! This little blurb caught my eye from the August, 2013 edition of National Geographic. If you have any more information on international bigfoot creatures, let me know by emailing me at NorthAmericanBigfoot@gmail.com.